An easy-care, low-maintenance perennial that bears clusters of pretty blue flowers! 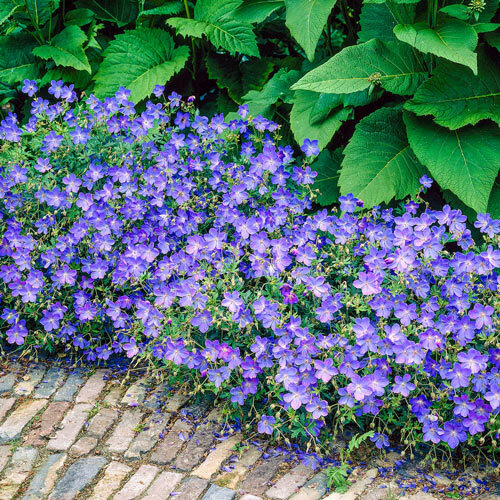 Johnson &apos;s Blue Geranium is a favorite for planting in cottage gardens, borders, containers and even as a ground cover. Up to 2-in. sky blue flowers bloom in clusters above the foliage from late spring to early fall. Grows 12-18 in. tall with a 24-30 in. spread. Attracts butterflies. Deer tend to avoid. For best results, plant in full sun to partial shade. Zones 4-8. LightFull sun where cool in Summers, shade in hotter climates. FoliageDeeply lobed and ancisely toothed foliage. Attractive palmate - dark green, 2 - 8" wide. ColorClear blue. Vivid clear blue with tinged pink centers. BloomsEarly summer main display and will repeat blooming later in the season. Soil RequirementsMoist well drained soil. Growth Rate12 - 24 inches. PruningCan cut back in mid summer to rejuvenate. CommentsVivid clear blue with tinged pink centers. Hardy geraniums are low-maintenance perennials ideal for borders, rock gardens or as a colorful ground cover. Size1 1/2 - 2 inches wide. DepthPlant with crown at soil surface.